Sir Roger Geoffrey Gibbs (born 13 October 1934) is a retired financier and who has held senior positions on the board of directors of Arsenal Football Club, the Wellcome Trust and Fleming Family & Partners. Gibbs was educated at Eton College and Millfield. After a career as a stockbroker he has been Chairman of Gerrards and National Discount Co Ltd. He was a non executive Director of Arsenal Football Club between 1980 and 2005. He retired from the club's board in June 2006. He was also Chairman of the Wellcome Trust between 1983 and 1999. He takes an active part in charity work and was Chairman of the St Paul's Cathedral Foundation. 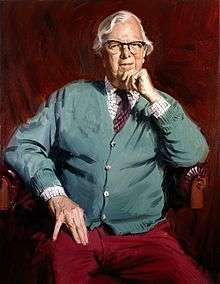 Gibbs was knighted in 1994. 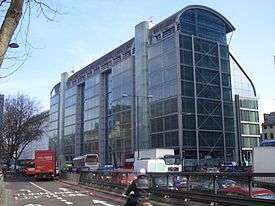 In 2004, The Wellcome Trust named its new headquarters on the Euston Road the Gibbs building to honour the significant contributions he made to the trusts finances. Gibbs is the fourth son of Sir Geoffrey Gibbs, KCMG, and Lady Gibbs, CBE. His younger brother Christopher Gibbs is an art dealer. He married his wife Jane on 21 September 2005. 1 2 3 "Sir Roger Gibbs retires from Arsenal Board". arsenal.com. Archived from the original on 2016-03-03. 1 2 3 Perry Gourley (2011). "75th stories: Rich diversity – Roger Gibbs and the Wellcome Trust's endowment". wellcome.ac.uk. London: Wellcome Trust. Archived from the original on 2015-09-24. ↑ Non-Executive Directors. Arsenal FC. 10 November 2005. ↑ The London Gazette: no. 53741. p. 10497. 1994-07-22. Wikimedia Commons has media related to Roger Gibbs.